KWAJALEIN, Republic of the Marshall Islands (March 01, 2011) -- No roads lead to Kwajalein. Everything on the atoll -- radar or satellite dishes, bolts, jugs of milk or cans of Spam, computers, bicycles, roofing shingles, lumber or gallons of fuel -- came off a barge or airplane. Kwajalein is, despite a lack of highspeed Internet and cell phone service, a fairly well-accommodated installation. There are fast-food restaurants, paved streets, solar-powered golf carts, an exchange, a grocery store, a chow hall, hundreds of homes and bicycles and plenty of radar dishes and other technology used to support the mission. 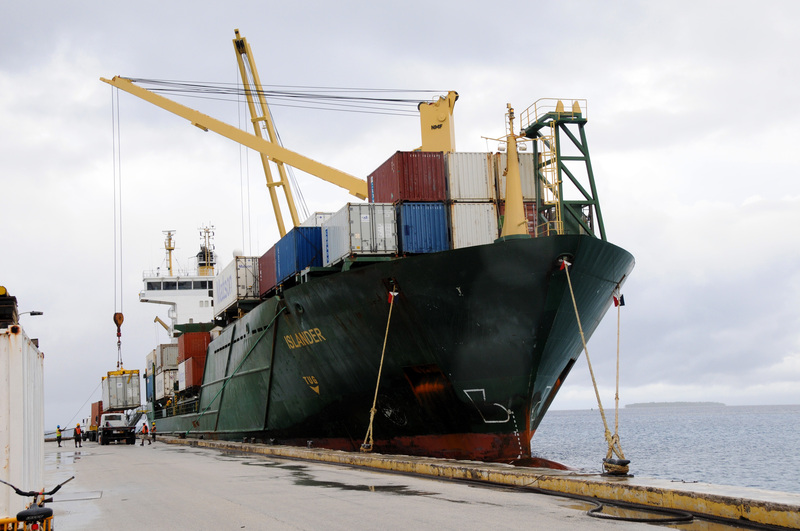 The Islander cargo ship is the chief supply line for Kwajalein Atoll. "There are over 98,000 types of items we stock," said Capt. Michael Quigley, director of logistics at U.S. Army Kwajalein Atoll. "We've got a pretty big logistics base we have to support and a lot of different items that aren't Army standard equipment." In addition to all the supplies that come in to support island life, Quigley said he maintains supply lines to support equipment used to conduct the mission at the Ronald Reagan Ballistic Missile Defense Test Site, such as satellite dishes and radar equipment. The island also maintains a small fleet of boats and aircraft that need parts. Every month, Quigley said, a fuel barge comes to the island to keep the storage tanks there full of diesel, jet fuel and gasoline. The island also needs food to support the people. That includes canned and dry goods that come in via the twice-monthly barge, and fresh produce delivered via aircraft. "We get two airplanes a week that fly out of Travis Air Force Base in California, to deliver pallets to Hickam Air Force Base in Hawaii and then they fly them out here," said Quigley. "It's mostly fresh fruit and vegetables, mail and labs (medicines, etc.) -- things with low shelf lives that need to be refrigerated -- things that can't be sent by a barge or a ship." Many supplies delivered to Kwajalein arrive via "The Islander," a cargo ship that brings everything from household goods, to new TVs to be sold in the exchange. The ship travels from California, to Hawaii, to Guam, and finally, to Kwajalein. "Every two weeks The Islander comes up and it's our primary source of receiving cargo," said Robert Chadwell, the port captain at Kwajalein. "All the food and supplies come in on the barge. It's our lifeblood. If it gets delayed, the food doesn't arrive and everyone starts calling the colonel." The commander of U.S. Army Kwajalein Atoll, Col. Joseph N. Gaines, has taken those calls before. But he said the folks on Kwajalein are generally a hardy bunch. "We just ran out of paper products -- we had a glitch in our ordering system and we were out of paper products for a couple of weeks," Gaines said. "The great thing about the community out here is they sort of endure these burdens of shortages and not having certain things because the trade-off is they enjoy a quality of life here that is unmatched anywhere in the United States." Chadwell said nearly everything comes in by sea. The installation gets about 30 to 40 containers each time the barge comes in -- nearly 1,000 containers a year. Goods are kept in 22 warehouses on the island -- nine of which are climate-controlled. Chadwell is also responsible for another logistics effort -- moving Marshallese workers back and forth between Kwajalein and Ebeye, where they live. He also runs the boats that move American workers between the other islands in the atoll where the Army conducts operations. "We put about 900,000 passengers a year through our little port here," he said. "We have here on Kwajalein two passenger ferries that run all day long, back and forth, taking Marshallese up to Ebeye. And we also have two fast ferries that do the trips up to Meik Island." Recently, Chadwell said, the Army purchased two new ships, faster passenger ferries that will arrive in early 2012. Besides moving passengers between islands by boat, Quigley is also responsible for the inter-island aviation services, including fixed-wing aircraft and helicopters. One thing not shipped to Kwajalein, but perhaps the most important supply of all, is fresh water. A triple chamber incinerator burns garbage on the island, leaving only a fine ash and heat as the byproducts. "Water is life here in the Pacific," said Gaines. The water on Kwajalein is captured from the rain through several catchments on the island's runway. "If you look out on the airfield, you can see the yellow catchments out there -- we have three really large ones," Quigley said. "A lot of people out here complain about the rain, but it's a nice thing to have, so we don't have to ship water out here." The island gets about 100 inches of rain each year, most of that coming between May and November, the region's wet season. Dan Eggers, the utilities manager at Kwajalein, said just one inch of rain yields about four days of drinking water for the island. "We go through about 210,000 gallons a day, and one inch gives us about one million gallons," he said. "But that's fresh water -- we go through more non-potable water. That's used for flushing the toilets and for irrigation, and for general gray water usage." On Kwajalein, used water is recycled and sterilized into gray water. That's non-potable water, meaning it isn't intended for drinking. But gray water is pumped back into a special water system used to flush toilets, water lawns and wash vehicles. About 99 percent of homes on Kwajalein are equipped with the gray water system. "It's the way we can take the best advantage of the limited resource we have here," Eggers said. Water on the island is brought in from catchments on the runway and pumped into a system of 11, 1-milliongallon untreated freshwater tanks. There are also two similar tanks for potable water, and two tanks for gray water -- a total of 15 million gallons of water storage. During the dry season, the island doesn't capture enough water in the catchments, so alternative sources are needed. "In the dry season, our rainfall will go from 10 inches a month to maybe one or two inches a month," said Stan Jazwinski, the liquid systems manager. "So in the dry season when we don't get enough water, we pump water out of the ground. 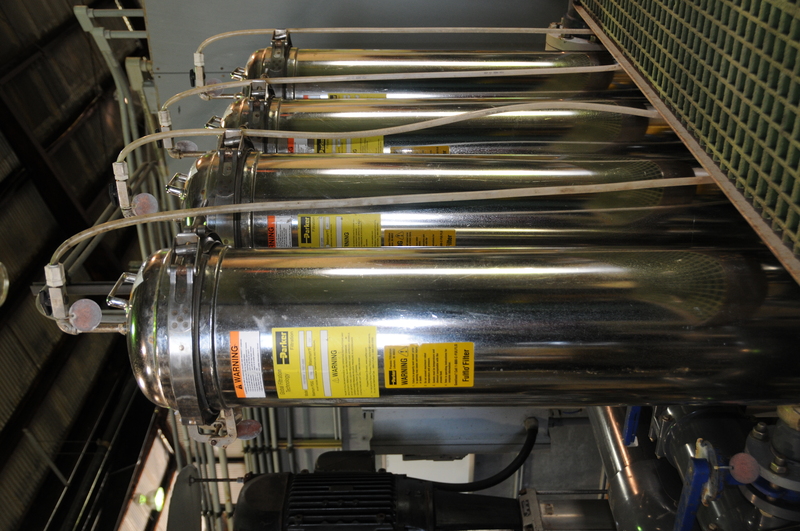 We put it through our filtration system and then to the reverse osmosis system. That removes organics as well as salt." When it rains, the water seeps into the ground, and forms a "lens" as it floats above saltwater already in the ground. Drilling into the ground, technicians on Kwajalein can pull freshwater out of the "lens well," to use during the dry season. "In the lens well, fresh water is on top and if you pump that off slowly, you can pull very good fresh water out of there," Jazwinski said. Years ago, the island used to do reverse osmosis on seawater, Jazwinski said, but the process was too expensive to maintain. "Now we're taking brackish groundwater and running that through the reverse osmosis system," he said. "It's a lot lower electrical use and it's a lot easier on the equipment. It's not nearly as challenging to keep the equipment running. Seawater is extremely corrosive." It's not just water on Kwajalein that's recycled. 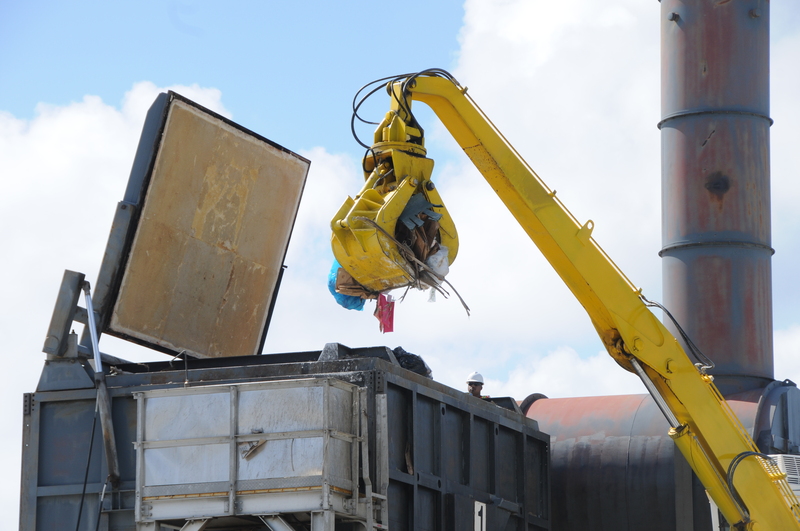 Just about everything here is recycled or incinerated, said Bill Craft, supervisor of the incinerator in Kwajalein. Both fresh and brackish water on Kwajalein is purified using a reverse osmosis system to make potable water for drinking and showering. Waste includes household refuse, industrial material, tires and palm fronds. About 53.4 cubic yards of trash comes in each day from around the island to be burned. The incinerator has three chambers. The two outer chambers burn just about any kind of trash you can put in them, and the center chamber re-burns the exhaust from the outer chambers at about 1,600 to 1,700 degrees. The result is a talcum-powder- like ash that comes out of the two outer chambers and heat from the center chamber's smoke stack. The center chamber also uses another waste product from the island: used motor oil. "We pump it into that center chamber. It's a secondary fuel source," Craft said. "So instead of burning diesel, we burn waste oil." Craft said that by using the waste oil in the incinerator, they avoid shipping it back to the U.S. for disposal. And because it replaces diesel fuel, they don't have to ship that in to the island. In the past, there had been a landfill. But now, Craft said, they are excavating that landfill and burning the refuse once stored there. "It's to remove our footprint from this island," Craft said. Glass is also reused. Near the incinerator, there's a facility that collects used glass bottles from the island's recycling program. "We use the accumulation of glass we've collected from throughout the island in the residential areas as well as the industrial areas," said Terri Hibbert, the environmental safety and health manager on Kwajalein. "We collect the glass bottles and then we crush and reuse them." Terri said the glass is crushed into two aggregates of sand that can be used for various industrial purposes. Making that aggregate on island from waste means they don't have to ship it in. "The very fine form we use in the sewage treatment plant on the drying beds," Hibbert said. "Once the drying bed is finished, we collect that along with the sand they use to dry it out, and we scoop that up and process it in the composting operation." Hibbert also said the glass sand they manufacture is used as fill under pipes during construction and as top cover when landfilling ash from the incinerator. "This is not some fad program," Gaines said about USAKA's recycling, reuse and incineration programs. "Now we incinerate everything or recycle everything." Gaines said Kwajalein also ships scrap aluminum off the island for reuse. "For us it's not a luxury, it's an imperative," he said. "We have a limited amount of space here. We can't afford to have large landfills like they do in the United States." A lot moves in and out of Kwajalein, Quigley said, and much of what comes to the island, whether naturally as with rain water or via barge or aircraft, as with supplies and equipment, is reused or recycled. But it's the success of the atoll's logistics program that makes life and work possible. "Without logistics, nothing happens -- and you are not able to do your mission," he said. "The only things I don't have to ship onto this island are coconuts. We have plenty of those."